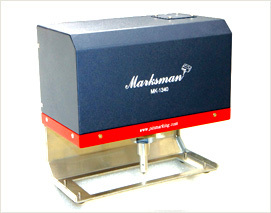 The MH-Gun marking machine is made for hand carry marking. There are pneumatic model and electric model. A big material or hardly moving materials need a marking; you can take a MH-GUN to mark. The front V-ZIG made a stable stick with materials. Also, It can move up and down for marking deepest. And, customer can choose pneumatic or electronic to their purpose.